Is the rupee a one-way bet? 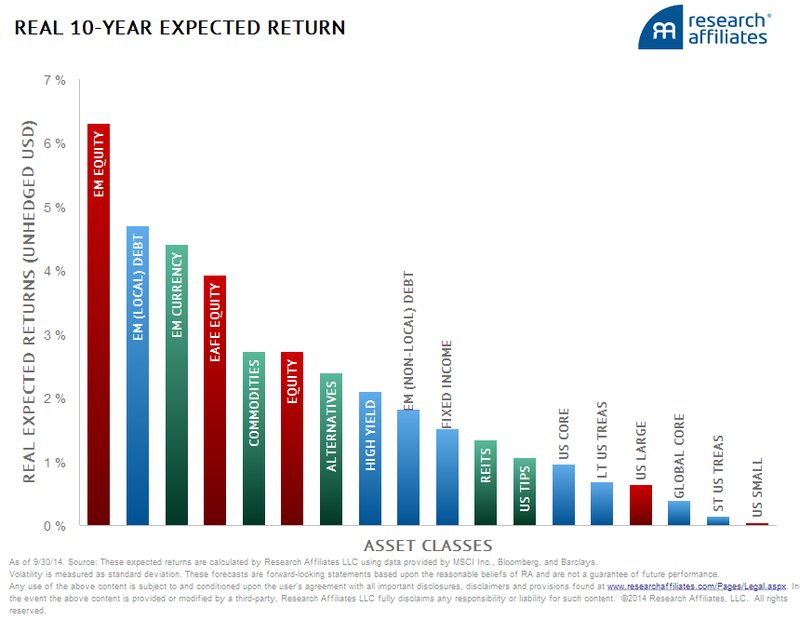 Interesting set of graphics from Research Associates (ht: Barry Ritholtz) on real 10-year expected returns on a variety of asset classes. The one on currencies was of particular interest since unhedged returns on rupee investments (borrow abroad in dollars and invest in short-term rupee bills, and keep rolling them over) topped all other currencies. India has one of the highest inflation rates among all emerging economies and its inflation trajectory is not expected to subside dramatically. Therefore the prospects of any sharp decline in its high interest rates is not promising. This, coupled with the liquidity trap conditions in developed economies, again likely to persist for some time, points to attractive carry trade potential from borrowing in dollars and investing in rupee assets. This short-term one-way bet and the consequent vulnerability it imposes by way of capital flows and sudden-stops makes capital account management an important macroeconomic challenge for the country. 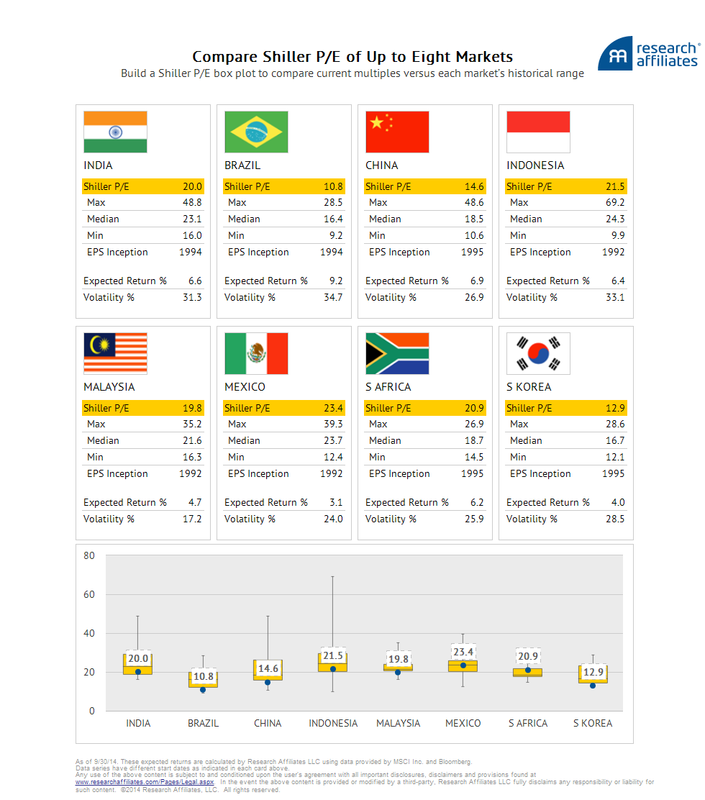 A comparison of the cyclically adjusted PE ratios (real price divided by average of real EPS over the past ten years), CAPE, reveals that Indian equity market is among the most volatile and remunerative. The importance of this graphic comes from the attendant capital flows related vulnerabilities that emerging markets face from cross-border capital as they search for yield in an environment of ultra-low interest rates. I believe that the correction seems to be overdone and investors can expect a pullback in the near term. For markets to bounce back to previous highs, a lot of positive news flows would be necessary over the next few months. In this environment, I would continue to be moderate in our investment approach and would focus on defensive investing, higher cash positions as tools. I would step-up our research efforts on more in-depth analysis on funds so as to capitalize on this environment, which we believe will throw up company specific opportunities. I believe that long-term structural bullishness of the Indian markets remains unchanged. The views/opinions given above are for informational purposes only and should not be construed as an investment advice. This emailer is addressed to and intended for the investors of Ritesh Sheth & Tejas Consultancy only and is not spam. You are advised to contact Ritesh Sheth & Tejas Consultancy to clarify any issue that you may have with regards to any information contained in this emailer.The views are personal. Ritesh Sheth & Family or Tejas Consultancy does not guarantee the accuracy, adequacy or completeness of any information in this emailer and is not responsible for any errors or omissions or for results obtained from the use of such information. Ritesh Sheth & Family or Tejas Consultancy does not have any liability to any person on account of the use of information provided herein and the said information is provided on a best effort basis. In case of investments in any of our schemes, please read the offer documents carefully before investing. In India, there is emerging anecdotal evidence of reduced propensity to hedge foreign exchange exposures arising out of a sense of complacency. The unhedged exposures in respect of External Commercial Borrowings (ECBs)/ Foreign Currency Convertible Bonds (FCCBs) lead to large scale currency mismatches in view of the bulk amount borrowed by domestic corporates for longer tenors with limited or no natural hedges. Further, the increasing use of bond route for overseas borrowings exposes the domestic borrowers to greater roll-over risk. As per indicative data available with the Bank, the hedge ratio for ECBs/FCCBs declined sharply from about 34 per cent in FY 2013-14 to 24 per cent during April-August, 2014 with very low ratio of about 15 per cent in July-August 2014. Large scale currency mismatches could pose serious threat to the financial stability in case exchange rate encounters sudden depreciation pressure. Hedging or not, the fundamental reality has been the sharp increase in ECBs in recent years. 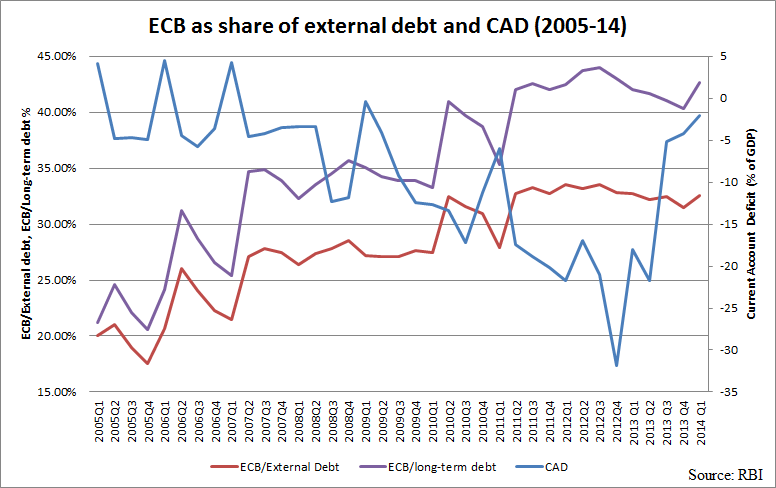 ECB as a share of external debt has doubled since 2007. As I have blogged earlier, the government has consistently, in response to rising external imbalances, relaxed the ECB norms. Similarly, short-term debt too has risen sharply in recent years. 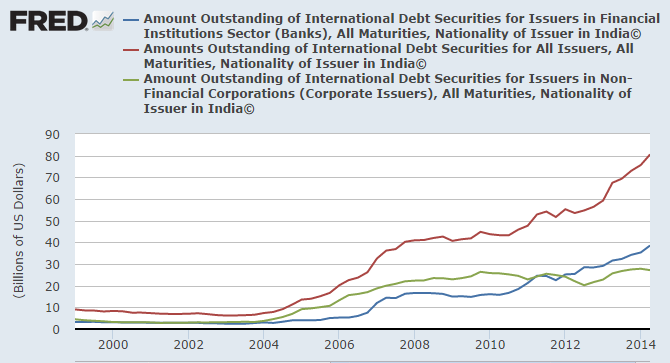 The portfolio of international bonds of all maturities, mostly raised by corporates and financial institutions, has risen dramatically since 2008. The decline in hedging has been attributed to the growing belief that the rupee value is likely to stabilize at Rs 60-62. Recent stability in rupee despite continuing turmoil in many other emerging market currencies, prospects of economic recovery, declining commodity prices (and consequent downward pressure on current account deficit), and a perception that RBI would aggressively defend the currency are thought to underpin this belief. However, these optimists overlook India's persistent high inflation, easily the highest among all major emerging economies. This is unlikely to decline to the levels in other emerging economies anytime in the near future. The consequent depreciation of real exchange rate is not only inevitable, but also desirable. Further, as the US Fed exits quantitative easing and given the relative strength of US economy in comparison to the economic weakness in Europe, the recent trend of strengthening US dollar is likely to persist for the near future, thereby adding more downward pressure on the rupee. If these trends play out, as they look likely to, then a depreciating rupee will leave the unhedged corporate borrowers in serious trouble. Once the US economic recovery takes firmer hold and interest rates start rising, coupled with a depreciating rupee, a backlash by way of capital flight, in whatever scale, is a real possibility. It would leave the Indian economy, especially its banking sector, exposed to problems similar to that experienced by countries like Thailand and Indonesia in the late nineties and Spain and Portugal just recently, albeit on a smaller scale. It is therefore important that the RBI and government make corporates to periodically share the details of their external exposures. This will enable, as Paul Tucker recently pointed out, banks to deploy more prudent macro-prudential norms in their lending to corporates with larger unhedged external exposures. 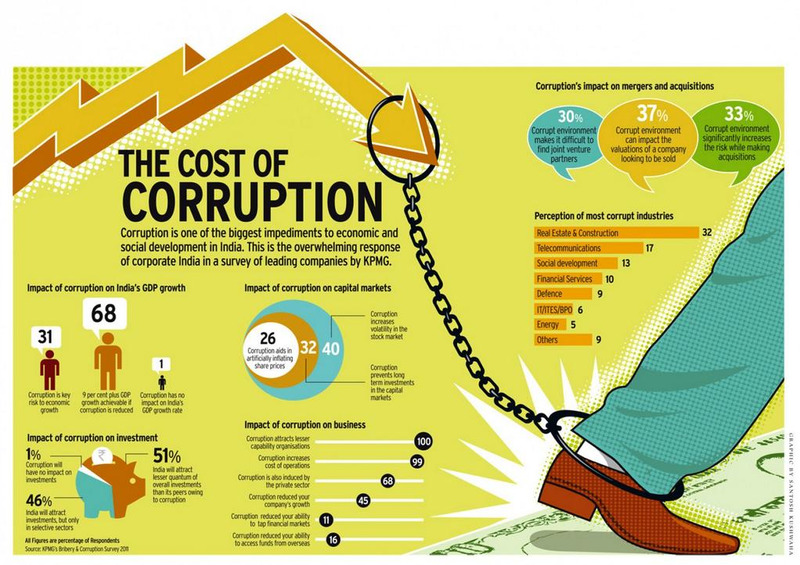 As the Indian economy continues on its uncertain recovery path, it is worth looking back at where things went wrong. The following two graphs are instructive. The first graphic tells us that investment and credit growth have fallen precipitously since the Great Recession struck. 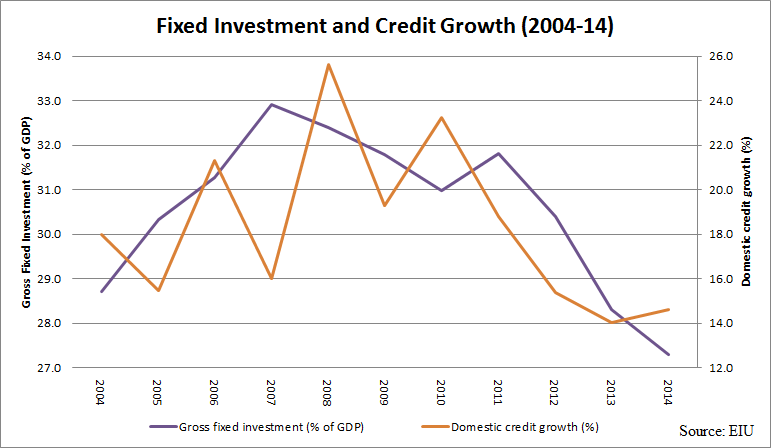 The decline in gross fixed investment has been alarming, falling sharply from 33% in 2007 to just above 27% estimated for 2014. In the 2008-14 period, credit growth has nearly halved from its peak in 2008. The twin effect of this decline on the economic growth becomes evident from the second graphic. 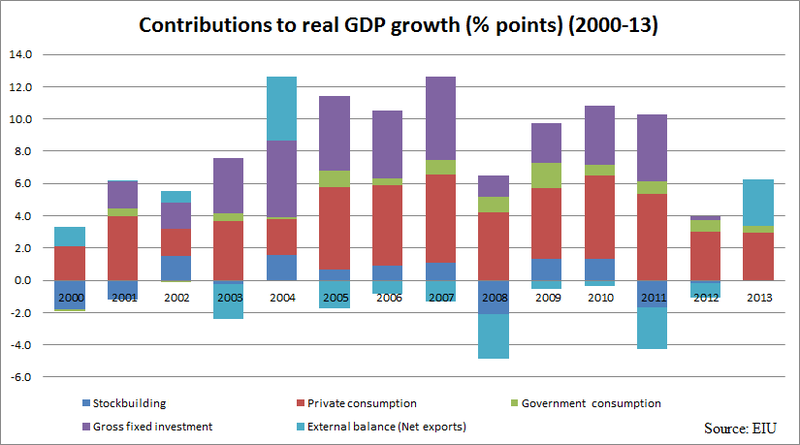 Consumption and fixed investment, two bulwarks of growth for much of last decade, have tanked dramatically. 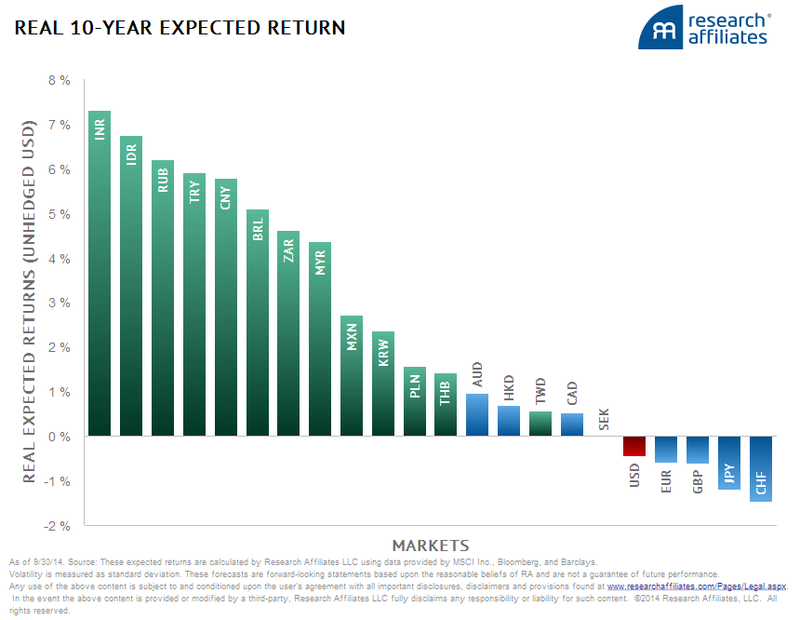 Investors have virtually gone missing over the past two years. Inventories, a good proxy for business confidence, has shown negative or no growth since 2010. In simple terms, consumers have to spend more and businesses have to invest more, thereby generating the virtuous circle which can sustain a high growth trajectory. In the face of formidable headwinds - high interest rates, high inflation, deficient infrastructure, weak global cues, and bruised bank balance sheets - the prospects for either looks bleak.